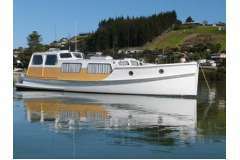 Solid Kauri construction, Ex commercial fishing vessel out of Akaroa but now converted to pleasure use. Has an icebox plus 80 watt solar panel, 2 x house batteries and one engine battery, she weighs approx 4 to 5 ton. Walk around decks with side door access, large cockpit.